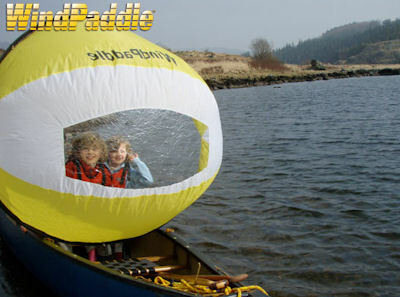 We have designed the WindPaddle "Cruiser" sail for canoes, tandems, inflatables and fishing kayaks. We've kept all of the lightweight easy-of-use features of our other sails but with 50% more power for the heavier boats. The "Cruiser" sail connects to existing boat hardware (perimeter line, bungy cords, eye-straps, etc.) so there is no need for deck mounting hardware or complicated installation. All WindPaddle sails launch and fly from the on-deck or in-boat position. They can be set-up for instant self-launching either before sailing or while out on the water. water, so there's no need to return to shore to launch sail!